PISCES - "I BELIEVE, THEREFORE I AM." 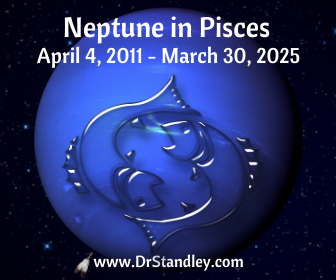 NEPTUNE OPPORTUNITY - Neptune is in Pisces (its 'Home' placement) from February 3, 2012 until March 30, 2025. 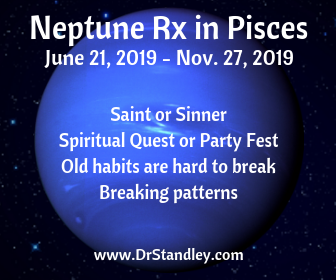 Neptune will Retrograde (Rx) on June 21, 2019, which is the same date that the Sun enters Cancer, which will be on the Summer Solstice. 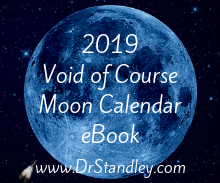 The Retrograde will last five (5) months until November 27, 2019. That is a long time, but Neptune does Retrograde every single year for about five (5) months, so this is nothing new. 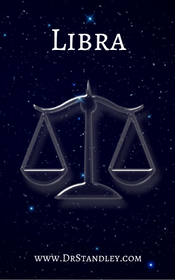 While Neptune is Direct, we to see things more clearly than we do when Neptune is Retrograde. We go from clear skies and a refreshed mind to a foggy visual and cloudy water when Neptune turns Retrograde. This especially impacts us mentally and spiritually since Neptune and Pisces rule both, which naturally rules our mental health. Neptune is also in its home placement 'Pisces'. If you notice from one of the Astro-Memes below, Neptune in Pisces Retrograde addresses our decision and indecision as -- Saint or Sinner? Spiritual Quest or Party Fest? Old habits are hard to break. Breaking patterns. What were you doing during Neptune Retrograde last year from June 18, 2018 until November 24, 2018? Did you break some habits and patterns or are you at the same place you were back then, which means better luck next time, which will be June 21, 2019 until November 27, 2019. Neptune is a very spiritual planet, but with the wrong mix, it can easily turn into a drunk planet. This planet is 'high' either on spiritual or on drugs or alcohol. However Neptune has to get there, to that 'spiritual ecstasy' state, it will do it. Neptune is all about 'Spirit' not 'spirits' as in alcohol. Neptune is all about 'your spirit' not 'spirits' as in ghosts. Naturally, if you choose the route of alcohol and ghosts, then this is what you will experience, even if the ghosts become your past haunting you. I will be writing more on this subject matter to post on the date that Neptune turns Retrograde on Monday, June 18, 2018. Stay tuned and watch for it on social media. 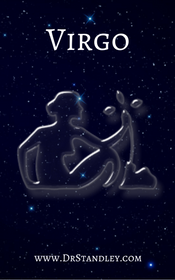 Remember Pluto (another generational planet) is in Capricorn from November 26, 2008 until January 20, 2024, which is very close to the same amount of time as Neptune in Pisces from June 18, 2018 until March 30, 2025. Not to mention, Uranus in Taurus (another generational planet) will last from May 15, 2018 until April 25, 2026, which is an 8-year stretch plopped right in the middle of Neptune in Pisces and Pluto in Capricorn. This is a culmination of energy involving all three (3) generational planets - Neptune, Uranus and Pluto that will fulfill themselves all within a couple of years of each other. Folks, these are generational shifts because these are generational planets, which tells us that patterns are being broken on a generation of people. 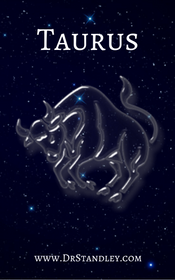 What will make you a Good astrologer is being able to see the patterns. These patterns that 'have to be' broken are recurring themes, ideas, habits and behaviors that have been handed down from generation to generation through the family. Breaking these patterns is going to hurt and it is going to hurt bad. Patterns are hard to break, but they must be broken for us to move forward as a population of people. Neptune, Pluto and Uranus (the planets on this page) are affecting us all. These are not personal planets, they are generational planets that affect 'a generation'. Neptune in Pisces wants closeness, intimacy, hand to hand, face to face connections with deeper feelings, almost a sonar feeling (like a fish). As Neptune grows back in Love in its home sign of Pisces, I believe Love will return to what is meant to be. That would be a face to face connection and not a computer to computer connection where we can remain aloof and distant. Neptune in Pisces will bring a spirit connection between two people. In other words, I believe we will see a big ol' fat level of maturity in the romance department. This Neptune in Pisces placement is certainly going to bring compassion, understanding, sensitivity and tolerance to relationships where before it was a little too easy and a little too okay with society to discard a partner and get a new one. Romanticism is back with Neptune in Pisces and when this planet turns retrograde, it wants a do-over so it could get it right before it progresses forward. Neptune has the ability to make us a saint or a sinner. Neptune in Pisces can easily go into spiritual excess but how we get there is the key point. Some may choose alcohol and drugs to reach nirvana, while others may choose philosophy, religion, meditation, etc., in order to get there. NEPTUNE KEYWORDS: Sensitivity, idealism, compassion, faith, spiritual guidance, spiritual strength, creativity, the path of least resistance, escapist tendencies, imaginative, intuitive, evasive, sentimental, indecisive and hypersensitive. Neptune rules the weekday, Friday. The Neptune glyph represents aspiration or an extension of the personality due to the extension of the crescent in the upward direction atop of the cross ascending the personality above all matter. Neptune is the higher octave of Venus, which is why Venus is exalted in Pisces. Venus in Pisces IS unconditional Love! 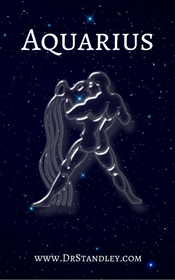 Check out the Neptune Moving Through the Signs Calendar. Dates are listed from 1915 up until 2025. The last time Neptune was in Pisces was from 1847 until 1862, so when you think about it there is not one single person 'today' on the face of this earth who was alive the last time Neptune was in Pisces. 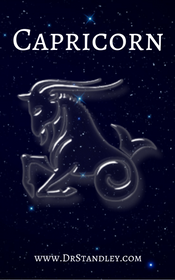 It takes approximately 13 years for Neptune to make its way through each sign and when you times that by 12 (all 12 signs) that's about 164 years for it to roll through Aries and finish up in Pisces. 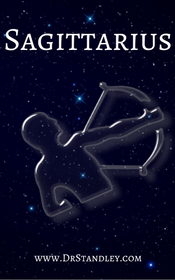 Everybody has Pisces in their natal chart . . EVERYONE! 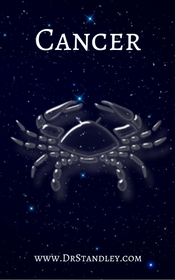 Even if your Sun sign isn't Pisces, you still have Pisces somewhere in your natal chart. Depending on where Pisces lands in your chart, this would be the type of energy you would bring into that house. 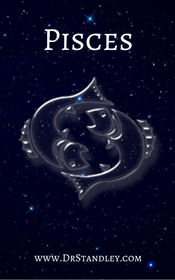 Notice that the glyph for Pisces represents the two fishes swimming in different directions and for this reason, Pisces often meet themselves coming and going. They also may sway when making up their mind, but once they find their belief system, they stick to it. Pisces is another duality sign like Gemini and Libra. While Gemini is two completely different people and Libra seeks to balance out two sides, Pisces is always seeking to find the meaning in something and always loaded with question. 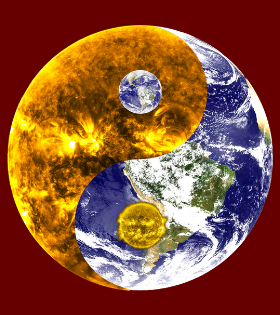 Pisces naturally rules the 12th house of past, karma, institutions, the hidden realm and secrets. And if anyone can hold a secret, it's a Pisces. They are highly influenced by the world around them, making them highly impressionable. Therefore, Pisces are intuitive, inspirational, they have high belief systems, idealistic, concentrated, hospitable, service-oriented, peaceful, refined, pure, perceptive, compassionate, sympathetic, impressionable, orderly and methodical. 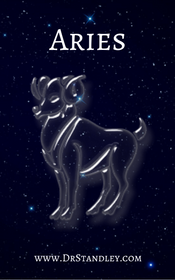 They are the most intuitive sign of the zodiac. Pisces are also sensitive, self-sacrificing and gentle. Pisces can be an escape artist, impractical, hyper-sensitive and gullible. 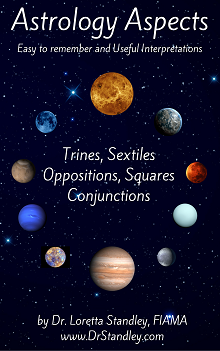 The first thing I want you to consider is that Neptune naturally rules Pisces, which is its home placement. Neptune is in its most comfortable state and its been a while, since 1862 to be exact. Since Neptune is the higher octave of Venus, then you can see how Love will be in an ascended state. This can easily make us all swirly and psychedelic where Love is concerned. I should also mention that when Neptune was last in Pisces from 1847 until 1862 it was 'part' of the period of Romanticism for music, art and literature. Now I said 'part' because the Romanticism era lasted quite a bit of time before and after 1847 to 1862 but Neptune in Pisces was smack dab in the middle of that period. This is such a wonderful time for the creative right brained minds -- music, art and literature. There has been a lot of talk on this being the Age of Enlightenment, but I guess we will see. I seriously doubt that a bazillion people will wake up and suddenly become enlightened, although I do believe a helluva lot of people will become more awakened. Some individuals have already been seeking on their own 'awakening' and still others may only receive an awakening by a two-by-four up along side the head. Hey, whatever it takes, right? 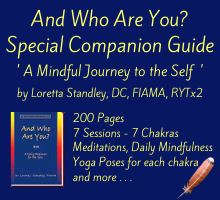 but it is simply your natural state of felt oneness with Being." Neptune rules sleep, anesthesia, drugs, paradise, narcotics, anesthesiologists, drunkedness, addicts, alcohol, bartenders, exaggeration, drama, acting, pharmacists, magicians, black magic, the occult, neurosis, hospitals, prisons, psychology, sensationalism, seances, trances, vapors and body weaknesses. I could go on and on and on, but you get the picture. Neptune has the desire to go beyond the conscious mind and slide right over the edge into delusions, illusions, deception and hallucination. What I think would be really cool is if people chose to go into an transcendental state or an ideal spiritual reality through intuition, meditation, solitude, contemplation, introspection, reflection or prayer because Neptune also rules these practices as well. But . . we'll see. Remember back in 2012 we kept hearing that we will all witness a change in Life as we know it, but no one is really saying what the hell that means? WHAT DOES THAT MEAN?!?! Honestly, I think those of us already on the path to reaching a high state of consciousness, higher state of Love, higher state of reality, higher state of intuition, higher state of spirituality, higher state of envisioning and all of those other wonderful higher states of wonderment will experience just that simply because it is what we seek. 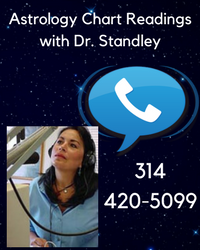 Still others may slide right into other altered states of consciousness through a little help from their friends called 'drugs and alcohol'. As people were busy reinventing themselves during Neptune in Aquarius (because Aquarius is the sign of invention and innovation) and stepping into new career roles, parenting roles, relationships roles and Life purpose roles, I think we are going to see that reinvention manifest on grand scales. It is very exciting. We saw people leaving their Life long careers only to dive into a whole new career change. I did. 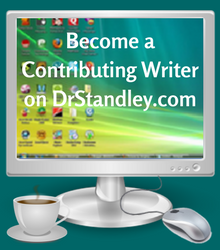 I went from owning and operating my own health clinic to re-inventing myself here on this website. There was a lot of career re-invention in the works for a lot of people. Did anyone notice how dang difficult Love was during Neptune in Aquarius? Neptune represents unconditional Love in the sign of the most detached, aloof and distant sign of Aquarius. This is when the dating websites took off and it became commonplace to find Love through the internet which is basically an Aquarian rulership. We could remain detached, distant, aloof and yet sociable at the same time. 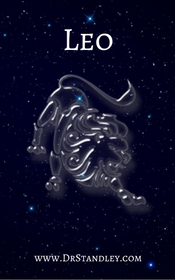 After all, Aquarius is THE MOST sociable sign of the zodiac. As Neptune grows back in Love in its home sign of Pisces, I believe Love will return to what is meant to be. That would be a face to face connection and not a computer to computer connection where we can remain aloof and distant. 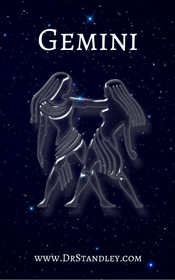 Neptune in Pisces will bring a spirit connection between two people. In other words, I believe we will see a big ol' fat level of maturity in the romance department. This Neptune in Pisces placement is certainly going to bring compassion, understanding, sensitivity and tolerance to relationships where before it was a little too easy and a little too okay with society to discard a partner and get a new one. Romanticism is back! Neptune in Pisces actually enjoys some privacy since both Neptune and Pisces rule the 12th house of solitude, privacy, behind closed doors and what you do not want others to see or know about you. I think it is going to be interesting to see what this does for reality TV shows because there are just some things that do not need to be seen by the whole world. Neptune in Pisces in its complaining state would say, "What! Is nothing sacred anymore?!?!" Neptune in Pisces is all about that which is sacred and spiritual, so putting it all out there including that which goes on behind closed doors that no one else should know on shows like the Jersey Shore, the Kardashians and others I think are going to get old very soon. People want to see higher forms of Love and spirituality rather than self-inflicted drama where grown adults cannot cope or handle their lives without a camera following them. People are going to be wanting closer, tighter and more connected relationships. Taking into account the Neptune rulerships that I typed in an above paragraph, Neptune has the ability to make us a saint or a sinner. Neptune in Pisces can easily go into spiritual excess but how we get there is the key point. 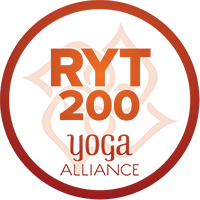 Some may choose alcohol and drugs to reach nirvana, while others may choose philosophy, religions, meditation, etc., in order to get there. While this is occurring, I think there will be a mass exodus of sorts when it comes to who we associate with as friends, acquaintances or organizations. Keep in mind our associations had a different purpose back during Neptune in Aquarius. While we could friend up with anyone at anytime, we also kept everyone at a distance through e-mails, texting, friending on Facebook and tweeting on Twitter, never really have to get close to anyone. Neptune in Pisces want closeness, intimacy, hand to hand, face to face connections with deeper feelings, almost a sonar feeling (like a fish). When it comes to social media now, there will certainly be a change in how these services are used. Once an individual gets, the get, that these services can promote their business or passion in Life, then using it to blab such personal thoughts and actions will go to the way side. A new day is a dawning and individuals want to transcend who they are and where they are in Life and this Neptune in Pisces transit is going to help. Neptune in Pisces certainly has Houdini tendencies (the escape artist) and some will do their best to avoid the need for change darting away like a fish. Have you ever tried to catch a fish with your hand? 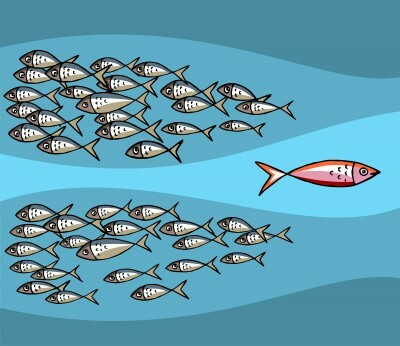 Still, the masses will take on the challenge and naturally migrate upstream to spawn like the salmon. Human beings are naturally Good, they want to Love and they want that spiritual connection. Neptune rules dreams and sleep, but this is one planetary transit that you do not want to sleep through. Instead, take the positive side of this transit and let it transcend you to a higher level of Love and spirituality and may your dreams literally come true. 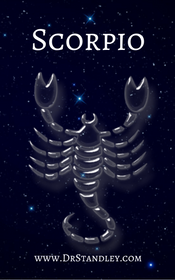 Check your Generational Horoscope to see how Neptune in Pisces will impact your Sun Sign. Stay Astrologized™.